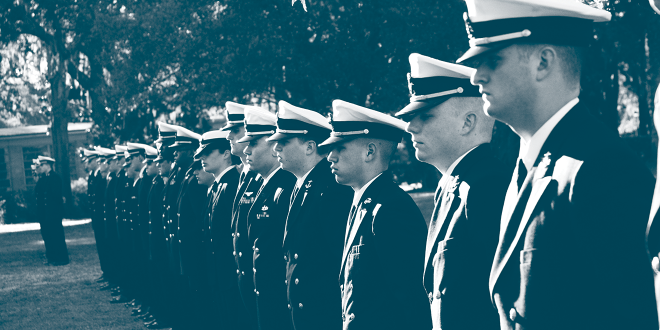 For more than four decades, the Jacksonville University Naval Reserve Officer Training Corps has been among the largest and most active student affinity groups on campus. The program also is a perennial leader-producing machine: more than 1,500 Dolphins have advanced to careers as U.S. military officers upon receiving their JU diplomas. These men are people JU can be so proud of, and JU has had a hand in their careers,” said Nancy Barker Rodriguez ’93, whose husband, Jose Rodriguez ’94, commanded Helicopter Maritime Strike Squadron 73 in Coronado, Calif., and now works in Naval Operations at the Pentagon. Offered at JU since 1971, the program provides a mixture of military training and traditional academic study, with coursework occurring in the classroom and in the field. JU has been reaching out to U.S. military members and veterans throughout the university’s nearly 80-year history, including opening its doors to sailors and soldiers after World War II. With its March 25 dedication of the Defenders’ Den, a new 1,000-square-foot Founders Building center for student veterans, along with the recent establishment of scholarships for military veterans and their family members, JU continues to steadily strengthen its military-friendly status, said Dr. Donnie Horner, JU’s chief government and community affairs officer. JU has about 400 student veterans and about 125 Naval ROTC participants during the 2013-14 academic year. Capt. Herbert Hadley, the JU NROTC program commander since 2011, also said it’s no accident the military leadership program has thrived at JU. JU Naval ROTC program participants-turned-commanders say the university is an ideal starting point for prospective military officers, partly because of its small, community-like setting and its proximity to Jacksonville Naval Air Station, Naval Station Mayport, Naval Submarine Base Kings Bay and the Marine Corps’ Blount Island Command. Bill Sherrod ’94, who commanded the Helicopter Anti-Submarine Squadron Light 49 in San Diego until November 2013, said JU and its Naval ROTC program set the stage for successful careers. Meanwhile, Jose Rodriguez said that callings as Navy officers are open to virtually everyone with ambition – particularly through the JU ROTC program.